If you’re looking for a temporary shelter that is easy to build, a pop-up tent is a perfect solution. When you compare it to a regular tent, it is lighter and quicker to build. A pop-up tent requires fewer materials for building, which allows for less mess and more room in the storage space. 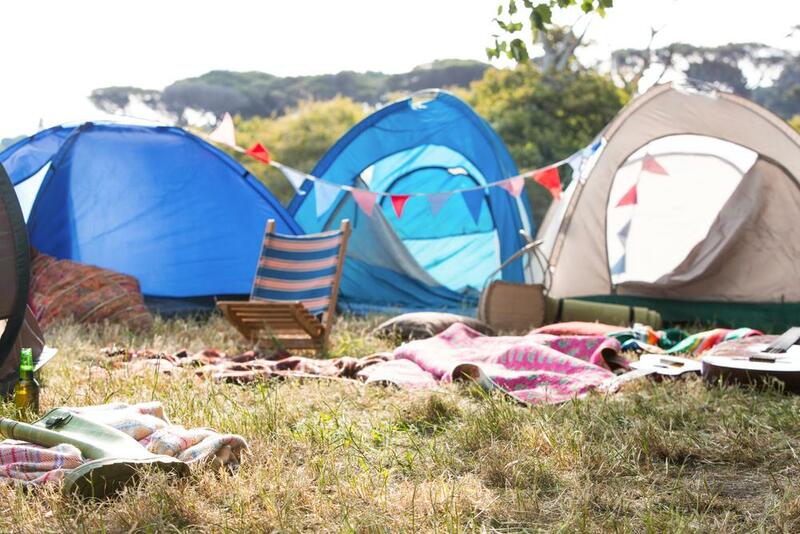 Pop up tents have been ideally used for music festivals and quick trips due to the convenience that it provides. Pop up tents come in different designs and sizes. If you are looking for your own pop-up tent, you may become confused with the variety of options on the market. We have decided to review ten of the most popular pop-up tents to help you in making a choice. The first pop-up tent on our list is the Quechua Waterproof Pop-up Camping Tent. It is a free-standing tent that allows for your tent to remain stable. You can install it easily and you can fold it up quickly. 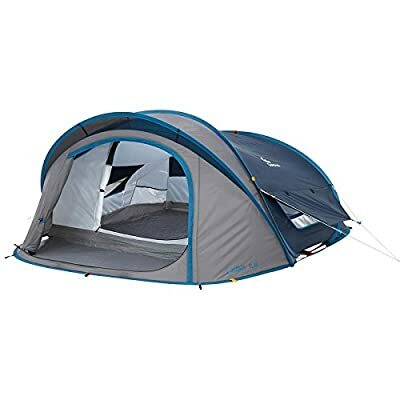 As an added benefit, it has a huge D-shaped entry point to ensure ease of entrance and exit from the tent. It can be closed using the integrated zipper so you can keep bugs away from entering your tent. For better ventilation, there is a fly sheet that is equipped with two side panels. These side panels can be separated and it is safely hooked to the side guy ropes. You may find yourself worried about camping when it is raining. However, every square meter of the Quechua Waterproof Pop-up Camping Tent can withstand 200 liters of water per hour. It also comes with a seam that has been sealed with a Thermo bonded tape. The inner tent, on one hand, is made from the breathable polyester material. This keeps you safe from the condensation that is maintained naturally inside the flysheet. In addition to this, the filters of the fly sheet keep you protected from UV rays as it comes with an SPF of 30. Finally, this pop-up tent is designed for three people to comfortably sleep in. If you’re taking your entire family on a trip, the Coleman 6-Person Instant Cabin can accommodate a group of six. It is made from 150D polyester with taped seams. The poles have been pre-attached for a quicker installation that will take less than a minute. All you have to do is unfold the pop-up tent and extend the pole. Finally, all that is left to do is to secure the tent in its place. For your protection against the rain, this tent is equipped with the WeatherTec System. This means that the floors and the seams on this tent will be able to keep the water out. It is a spacious pop-up tent that allows sufficient space to move around. 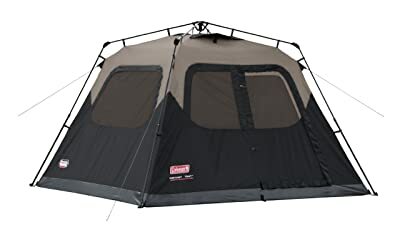 This is because the Coleman 6-Person Instant Cabin Pop-Up Tent is made with vertical walls and the center is taller in height as it measures six feet. Due to the structure of this model, it can easily accommodate six people, but it is on the heavier side. It is ideal to use for longer trips and for hunting. To ensure a comfortable sleeping position, it is best to use an air mattress or a sleeping cot. Moreover, the built-in rainfly allows for better airflow. However, it does not require you to do the extra assembly. The next pop-up tent is the 2 person Pop-up Tent by theNORTHblu. It has a dimension that measures 87 x 60 x 43 inches. Moreover, it also has a diameter of 30 inches when folded, which means that it can be folded in a compact manner. The installation of this unit is also a breeze as there is no ground tarp required during assembly. Therefore, you can easily set it up and fold the pop-up tent down when needed. There is enough room for two people inside this pop-up tent. Additionally, the entrance hole comes with a mosquito net to keep away the bugs. The 2 person Pop-up Tent by theNORTHblu is made from 190T polyester fabric that is long lasting. The poles, on one hand, are made from fiberglass materials. Despite the durability of this pop-up tent, it only weighs five pounds. This is the perfect addition to your child’s playhouse as it is compact and it is spacious enough for playtime. Apart from the pole and the tent, the hook stakes and storage are also included in your purchase. Moreover, it comes with three ventilation hole plus an inner side bag. It is a great pop-up tent, but it is not able to withstand outside elements like rain and wind. 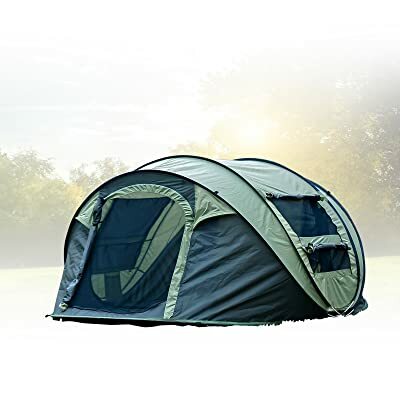 The next pop-up tent comes in a dome design and it is the FiveJoy Instant 4-Person Pop-up Dome Tent.It is a free-standing tent that pops up automatically from the packaging. Unlike a regular tent, this pop-up tent does not require complicated installation. Moreover, you can just fold it back up again to its carrying bag to ensure that there would not be any mess. It is designed with a mesh window that keeps your tent cool on the inside without compromising your privacy. The windows are located on the left and right side of the tent and they are covered by a nylon flap, which can protect you from bugs. For the entry point, there are double doors that can be accessed from either side. You can opt to leave the door completely open or close it using the screen material or the nylon door. The FiveJoy Instant 4-Person Pop-up Dome Tent is also equipped with a storage pocket to maintain order inside your tent. You would not lose you items inside the tent using the pocket. Moreover, there is also a hang loop that can help you hang your lantern or other items. For additional functionality, you can keep yourself protected from the sun. You just have to attach guy lines to the loops that are located under the window flap. Moreover, it is constructed in a durable manner as the seams are sealed and the zippers are solidly made. In addition to this, the materials used are made from water resistant PU coated polyester. However, this tent is not able to withstand heavy rains or extreme backpacking. The next pop-up tent is the Coleman 4-Person Pop-Up Tent. The setup time of this model is only ten seconds due to the pre-assembled poles and packing up this unit is also easy as it can be stored flatly. This means you get to enjoy your camping trip more without having to take hours of tent assembly. You can enjoy your music festival and camp more with the taped floor seams of this pop-up tent. It means that you will remain dry even during rainy days. There is also a multi-position rainfly that you can use to help with better ventilation or to get protection from the unpredictable weather. It is also spacious enough for four people to sleep in. However, there is no room for you to stand around. Moreover, there are two storage pockets inside the tent to keep your things organized. Overall, the Coleman 4-person pop-up tent measures 9 x 6 feet. It has a low center height of three feet. Moreover, it is also lightweight, which makes it easy to bring during backpacking trips. 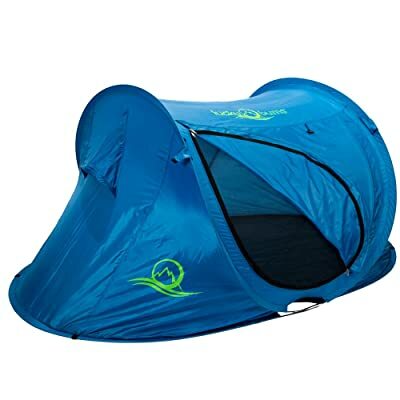 The next pop-up tent comes in three color options, which as blue, green, and light blue. 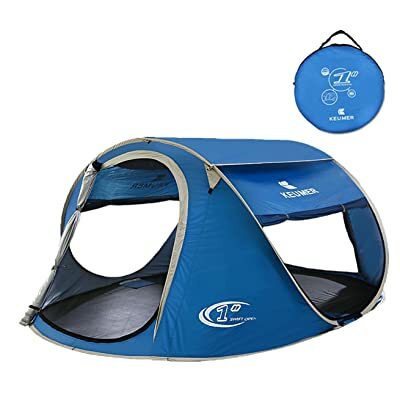 The Pop-up Tent Beach Cabana Automatic Instant Setup Water Resistant Ventilation and Anti-UV by ZOMAKE is a high-quality pop-up tent that is the ideal companion for your camping trips. The ideal capacity of this pop-up tent is for three to four people. This pop-up tent is ideally used during hotter climates, which is why it is best to avoid using it during light rains. 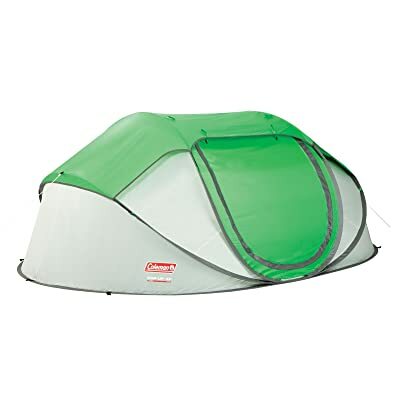 In terms of its measurements, this pop-up tent has a dimension of 39.4 x 70.9 x 94.5 inches and it weighs five pounds. This means that it is lightweight and extremely portable thanks to its fiberglass frame. Once it has been folded, it shrinks to 31 inches in diameter and you can store it in its own carrying bag. It is slightly bulky when stored. You can easily set it up as it automatically pops up. Moreover, it stays securely in place due to Hogan Hook Stakes. 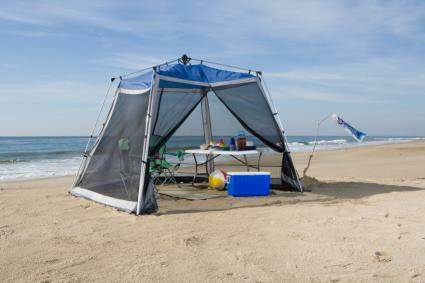 The Pop-up Tent Beach Cabana Automatic Instant Setup Water Resistant Ventilation and Anti-UV by ZOMAKE is an ideal tent to use at the beach as it is well ventilated as it comes with two doors and two windows. Additionally, there is also a skylight area that allows plenty of room for air to enter and you have a better view of the outdoors. The next pop-up tent is ideal for the millennial who enjoy attending musical festivals. 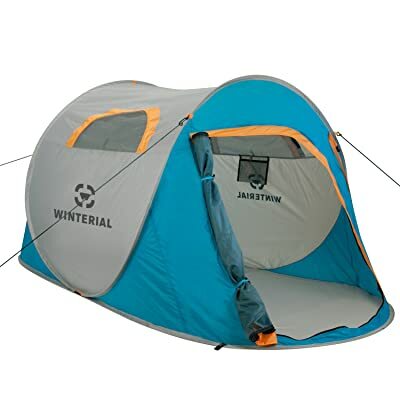 Once the Winterial 2-Person Instant Pop-Up Tent has been completely assembled, it measures 90 x 50 x 42 inches. There is no need for a ground tarp as it simply pops out of the tent. On one hand, it has a 25-inch diameter once it has been safely packed in the storage bag that comes with your purchase. You can easily fold it back up in four easy steps. It is best to refer to tutorial videos for the step-by-step guide on how to fold it back to its original state. This pop-up tent is made from 190T polyester fabric that keeps the tent longer lasting. There is sufficient room for two sleeping pads, which makes it great for the beach or for your backyard. It is spacious enough to sleep on and stand on. This pop-up tent, on the contrary, is not recommended for use for extreme backpacking adventures. In terms of ventilation, there are two windows and a huge door as an entry point. The fiberglass poles are lightweight and long lasting. 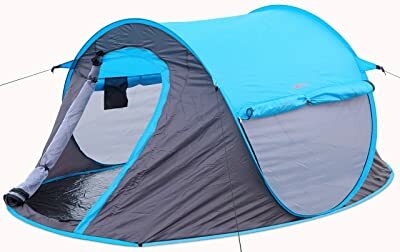 On top of that, there are hook stakes that are able to maintain the sturdiness of the Winterial 2-Person Instant Pop-Up Tent when assembled. Moreover, the carrying bag included on the list comes with a shoulder strap to easily carry this pop-up tent when you are on the move. The next pop-up tent has a limited capacity that can effectively provide sufficient sleeping area for one person. The Lucky Bums Quick and Portable Camp Tent is a compact and lightweight tent. It measures 80 x 50 x 36 inches that weigh 3.15 pounds. Despite the advertised size, it is slightly larger when it arrived. This allows for more space to move around. Similar to a lot of pop-up tents on the list, setting it up takes more or less thirty seconds. Despite the lightness of this tent, it is surprisingly sturdy. Folding it up is also an easy task and would not cause any problems. In case you are concerned about the quality of this product, the manufacturers offer a 100% satisfaction warranty. Due to its limited size, the Lucky Bums Quick and Portable Camp Tent are not ideally used for heavy-duty tasks. It is best for daytime camping like when you are camping outside a store to purchase your favorite book or gadget. You can get this in pink, blue, or red colors, which makes it an ideal addition to your child’s playroom. The next pop-up tent on the list is the Sunba Youth Pop-up Tent Portable Camping Tents for 3 Person. Moreover, it was designed to withstand water and sun rays. The materials used for this pop up tent makes it waterproof and it provides UV protection. There are also eight metal ground stakes and four strong ropes to keep your tent in place, despite the strong gushing of wind. To ensure better ventilation without providing room for the entry of bugs, this unit is equipped with a mesh French window. These windows can be unzipped. Moreover, the roof of the pop-up tent can be opened for better ventilation. You can easily zip up the tent to ensure that you can keep your sleeping area private. Moreover, there is sufficient space for up to three adults. 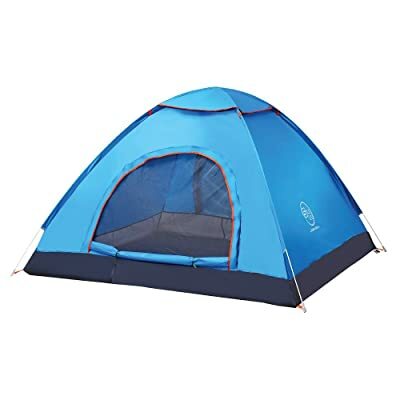 Similar to most pop-up tents, this can be easily assembled and folded back in its original state. The final pop-up tent on the list is the Survival Hax 2 Person Instant Pop-up Camping Tent. You can just open the packaging and the tent pops up in a fully assembled state. You just need to attach things here and there to maintain the stability of the tent. Moreover, it was also rather lightweight, which makes it easy to bring during hikes and other outdoor trips. In addition, it is made with 190D Oxford material that allows you to use this tent during light rains. The Survival Hax 2 Person Instant Pop-up Camping Tent can easily fit three adults. On one hand, it can also be able to fit two children and two adults, which makes it ideal for a young family. It makes camping tasks easier as you would not have to spend a lot of time to assemble a regular tent. There is also sufficient room to enter the tent as it comes with a front and back door. 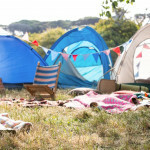 Before you purchase a pop-up tent, it is important to factor in some considerations. You should be able to assess your needs in order to know the type of pop up tent that you should buy. You might be surprised to know that there are several pop-up tent designs. Some of these pop-up tents are ideal for sleeping, but some pop-up tents are uncomfortable to sleep on. The pop-up tents that are ideal for sleeping are the tunnel, dome, geometric, and teepee tents. However, a multipurpose tent, shade pop up tent, and royal day room tents are not ideal for sleeping. Some pop-up tents are also specifically designed for the use of children to act as their own fort. Several pop-up tent designs are meant to accommodate more people, while some of them are designed for fewer people to sleep on or use. When you have a pop-up tent, you must also remember that it should be easy to pack away. The convenience of setting up your tent should not compromise the ease in storing them. Moreover, you pop up tent should be compact to make it easier to take on the road. It should also be easy to fix once it malfunctions. Pop up tents can also be manufactured to provide protection against outside elements. Some pop-up tents are designed to be waterproof. This allows you to use it continually even if it is raining on your camping site. Another constant concern when you are outdoors is the potential damage caused by the heat of the sun. This is the reason why some pop-up tents are designed with UV protection. You should also be able to consider your budget. However, you should make sure that the pop-up tent that you choose is giving you the best value for the money. There are several factors that you should consider. However, the most important thing to remember is that your pop up tent should be suitable to your personal preferences. We have reviewed ten pop-up tents and we were more than pleased with the results. However, there was one that stood out in terms of quality and performance. Based on our unbiased review, the best pop-up tent is the Coleman 6-Person Instant Cabin Pop-Up Tent. It provided all the advantages that should be found in a pop-up tent. 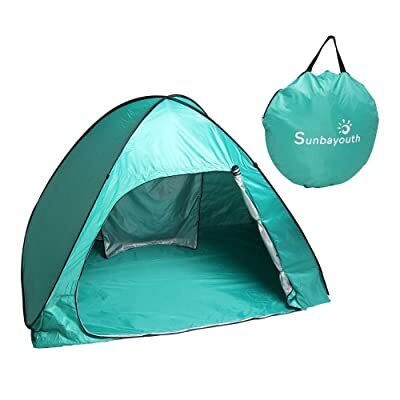 This pop-up tent was lightweight and easy to set up. It was spacious enough for the recommended capacity. On top of that, it was built sturdily and it was comfortable to use. You can take your family and friends on a camping trick without having to worry about your sleeping space. Moreover, you can even move around as you use it because of the high center height. We hope that you have found the perfect pop-up tent for you and your family.